The University of Central Florida (UCF) Knights football team will wear NASA-themed uniforms for a homecoming "Space Game" on Saturday, Oct. 14, 2017 in Orlando. A Florida football team is about to add a few stars to its Knights. 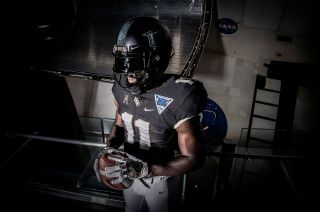 The University of Central Florida (UCF) has revealed that its Knights football team will wear NASA-inspired uniforms for their homecoming "Space Game" on Saturday (Oct. 14) against the East Carolina Pirates at Spectrum Stadium in Orlando. The special game wear includes a mission patch-adorned jersey and a stripe on the players' helmets that is meant to evoke the Saturn V rocket and features an image captured by the Hubble Space Telescope. The astronautical theme emphasizes the university's 1963 founding mission to support the growing space program at the Kennedy Space Center and Cape Canaveral Air Force Station. The school's motto — which is inscribed across the top of the game mission patch — is "Reach for the Stars." The embroidered emblem also depicts "multiple planets in the starscape to show what lies beyond our solar system;" the constellation Pegasus, borrowed from UCF's academic seal; a moon-like celestial body to "symbolize what we've already accomplished"; and a border styled to look like the patch's design is a view from a spaceship. The university's bookstore is giving away souvenir mission patches with purchases of $50 or more over the weekend. The space theme also extends to the Knights' helmets. The "UCF" lettering on the helmet features a moonscape fill. And a stripe spanning the headwear includes an image of the Andromeda galaxy assembled from Hubble data, as well as artwork of six astronomical constellations, including Pegasus, Taurus (a bull, representing the opponent), Orion (for resiliency on and off the field of play), Corona Borealis (the "northern crown," symbolizing the honor and duty of a knight), Gemini (which shares a name with the boulevard that encompasses the campus) and the Sextans (honoring the discoveries made by those who came before). The UCF Knights Oct. 14, 2017 ”Space Game" uniform is modeled in front of the statue of first astronaut Alan Shepard at the U.S. Astronaut Hall of Fame at Kennedy Space Center Visitor Complex. The stripe is divided into five uneven sections, each scaled to the stages of the Saturn V rocket that flew astronauts to the moon nearly 50 years ago. UCF's history with NASA goes beyond its proximity to the Florida spaceport. The school has been involved with eight missions, including the recently-concluded Cassini mission to Saturn and the on-going OSIRIS-REx asteroid sample return mission. The school is also home to NASA's Center for Lunar and Asteroid Science. Two U.S. astronauts have also been UCF alums, including astronaut-artist Nicole Stott and the late Frank Caldiero. To debut the new space game uniforms, UCF players were photographed posing with space shuttle Atlantis and at the U.S. Astronaut Hall of Fame at the Kennedy Space Center Visitor Complex. The Knights are not the first school football team to add a nod to space exploration history on their uniforms. Purdue University's Boilermakers added a decal to their helmets to memorialize to the late Apollo 11 astronaut (and alum) Neil Armstrong in 2012. The Clear Lake High School Falcons, who neighbor NASA Johnson Space Center in Houston, will don special NASA-themed helmets for their homecoming game at Challenger Columbia Stadium in Webster, Texas on Friday (Oct. 13). Watch the launch of the UCF Knights' "Space Game" uniforms at collectSPACE.